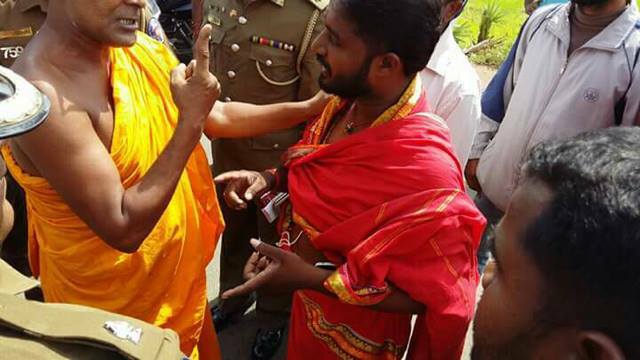 Police intervened once again when Batticaloa Buddhist monk Ampitiye Sumanarathana encroached into a private land where a Bo tree is and attempted to erect a Buddhist Temple. The Monk claimed the Bo tree on the Badulla-Senkallady Road, Pankudaveli area was a palce of Buddhist worship and has historical evidence. Tension mounted as he arrived with many Sinhalese in vehicles. Tamils also arrived as the land was owned by a Tamil. Apparently, the monk attempted to encorach this particular land and he was restrained with a court order. However he returned to the same land wanting to build a temple on November 16. When the matter was infomed to TNA MP Viyalendiran Sathasivam, he infomed the police and arrived to the spot immediatley. Police warned that no one should enter the property or remove anything from the land. The Monk claimed that Prabhalaran or any of his LTTE members did not harm him but people now are behaving like fools creating unnecessary issues and he did not want the land but only the Bo tree area to build a temple. He said he did not want to disturb the Tamil community or capture land however he would want to protect this place of worship. Police informed them there would be a police post at that spot and no one can enter the land in future. The monk has urged the Archeaological Dept to visit the place of historical importance and verify his claims. The owner of the land said the monk despite been warned and issued with a court order still harresses people bringing disharmony among all. They said he captures private lands and forces the governement officials to issue deeds. *Are you capable of knowing your state of mind at present moment ? Then you are not wise as you think. Practice sathara sathipattana ! As Buddha preached, the quickest way to attain nirvana is ‘Ana-pana-sathi’ meditation. It’s not what we did in schools. Learn the right way. May all you understand the four noble truths! Theruwan Saranai ! I feel sorry for Lord Buddha. If he would have known that he will create so much of hatred by his action he would have kept off from becoming a Buddha. People would have lived happily ever after. Buddhist monks are glad that Buddha keeps his eyes closed in Sri Lanka! This mad monk is not a Buddhist and he should be put away in prison. Nimal, Not in Prison, He should be in the Angoda Mental Hospital! Sumaratne Thero of Batticaloa leading a demonstration……………..
if you are an educated person, you would not agree with Mad Monks acts. See, what you get to see in the video is he behaves as if anarchy is the case. This man in robes has never allowed police to do their job. He has not th eleast respect to anyone. He even badmouthed to Mahinda Rajaakshe. He will get shot on his head by anyone in next days, since the enemies he make are more than the supporters world wide. This type of monks are very much in prominence in Burma. They are indirectly helping foreign powers destabilize that country. This is part of geopolitics and these type of trouble makers are being used and they are not aware of that they are being used. See how sad the situation in Syrya,Iraq,Lybya is?United peaceful countries are not to the benefit of some countries who want play geopolitics. These monks need to be controlled either by the Government or by the Chief Monk. The ugly head of religious venom is raising its head to poison the mind of the mass.